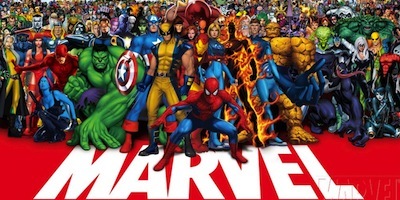 The Black Panther is a superhero in the Marvel universe. T’Challa returns to Wakanda to become king after his father’s death. Wakanda is hidden from the rest of the world. It’s technology is far more advanced than any one. T’Challa’s sister is the mastermind behind all the technology. She created a necklace for him that can manifest a whole Black Panther suit that’s made from nanonites. It’s an amazing piece of technology. You too can hold this piece of technology and wear the suit for Halloween or any Marvel superhero cosplay party. 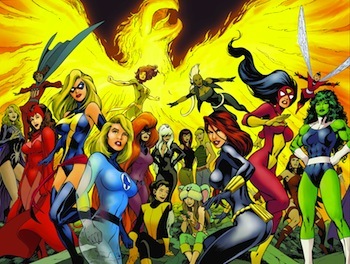 Click here to find more Marvel costumes. 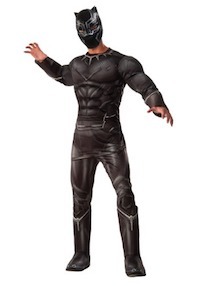 Find Marvel Black Panther Costume ideas for everyone below. This black and silver mask has subtle details throughout. The forehead has scrolling geometric pattern over the eyebrows, under the eyes, and under the silver sculpted cheekbones. It has wide eyes and two mouth holes so that you’ll be able to wear your mask comfortably. 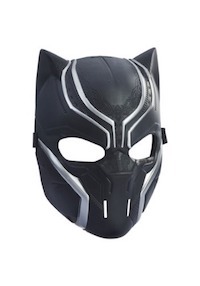 Click here to get Black Panther Costume Mask. 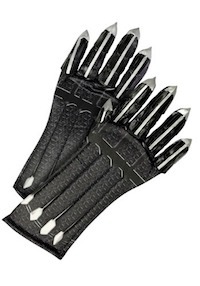 Gloves have polyester fabric base w/ padded cuff and attached vinyl accents on fingers. 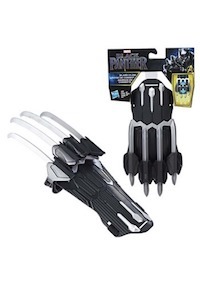 Your mitts will look terrifying once you put these licensed Black Panther claw mitts. An elastic band secures the claws to your wrists. The retractable five-inch claws will make anyone, children and adults feel like the chosen hero. Click here to get the Black Panther Claws. 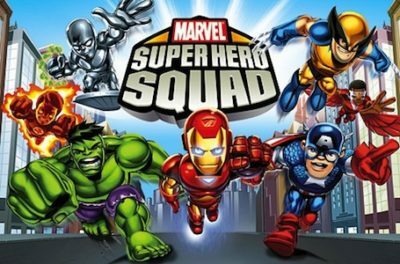 The costume comes with a black, full-body jumpsuit that has muscle padding in the chest and arms. That means you can look just as buff as T’Challa without any trips to the gym! The suit has other great details, like patterned printing on the chest and arms and a printed panther claw necklace is even printed around the neck! Of course, it also comes with a molded mask to help you conceal your identity from your many foes. 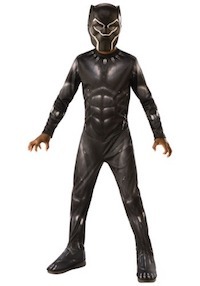 With this officially licensed Deluxe Black Panther costume for kids, he’ll look exactly like the coolest superhero on the planet! The jumpsuit comes with sculpted foam padding to create a highly muscular look. 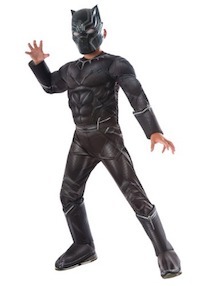 A molded plastic mask helps your child keep his secret identity concealed as he fights bad guys. 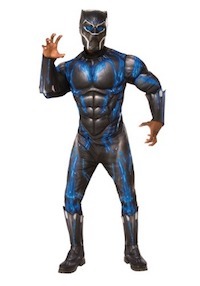 Click here to get Black Panther Costume for Kids. 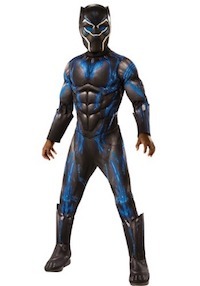 This Adult Deluxe Black Panther Blue Costume is officially licensed from Marvel Comics and the smash hit Black Panther movie. A polyester jumpsuit, it features foam padded muscle effects, and it’s fully printed. Printed details include Wakanda symbols and designs, and those aforementioned blue streaks of energy. Click here to get Blue Black Panther costume for kids. The basic tank dress has a printed silver necklace and armor details. Breaking out this ensemble is easy for Halloween and even more fun for every day. 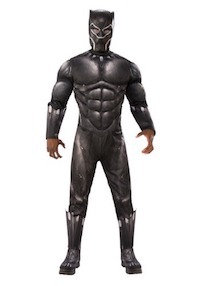 this Black Panther costume comes with a polyester jumpsuit that has printed details and fiber filled muscle definition in the chest. When you suit up in it, you feel a bit like a regal king and a lot like a ferocious jungle cat! 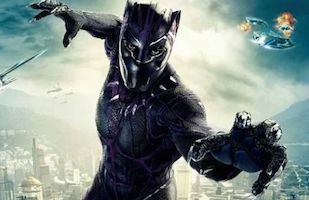 Click here to get the Marvel Black Panther costume for adults. This Black Panther Spike Cosplay Collar Necklace is officially licensed by Marvel Comics for an authentic style from the Black Panther movie. 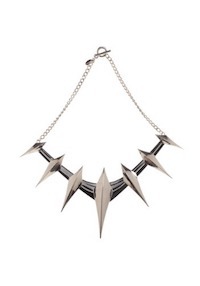 The metal front piece forms a semi-circle with 7 spikes, directly reminiscent of the character’s high tech suit. It secures around the neck with a 12 inch silver-tone chain that secures in the back with a lobster-claw clasp. Click here to get Black Panther Spike Necklace.